David Cush, perhaps the coolest named President and CEO of the cheekiest named airline, Virgin America, just spilled a few details at Fast Company‘s Innovation Uncensored San Francisco event about what Virgin has in store for passengers. The panel was focused on the topic of anticipating customers’ demands (there’s no shortage of them in the airline industry) and constantly competing not with others in the space, but yourself. Virgin’s set a high bar for itself. It’s the airline run by the carbon-slaying, naked-model-surfing moon jockey Sir Richard Branson. Asking people to sit idly in a cramped seat with nothing more to do but swap stories about leg pain just isn’t in his DNA. And that DNA is all over the Virgin experience. The proud member of the mile-high club handles the boarding process for his airline like Barry White handles a nightcap–passengers are greeted with trip-hop or chillwave and purple-tinted mood lighting. 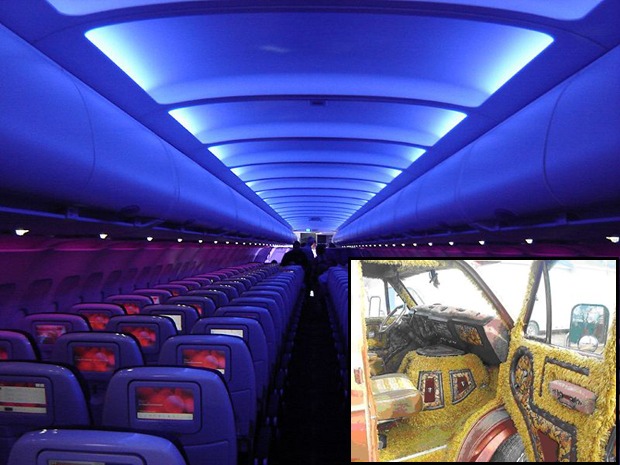 Soon, “On Virgin America flights, the cabin ceilings will feature star fields that change depending on where you are in flight,” Cush said, an aesthetic seemingly inspired by the golden age of the custom van, circa ’72. The captain has asked that you buckle your seatbelts and return your seats to the upright position. We’re headed directly for a quiet storm.